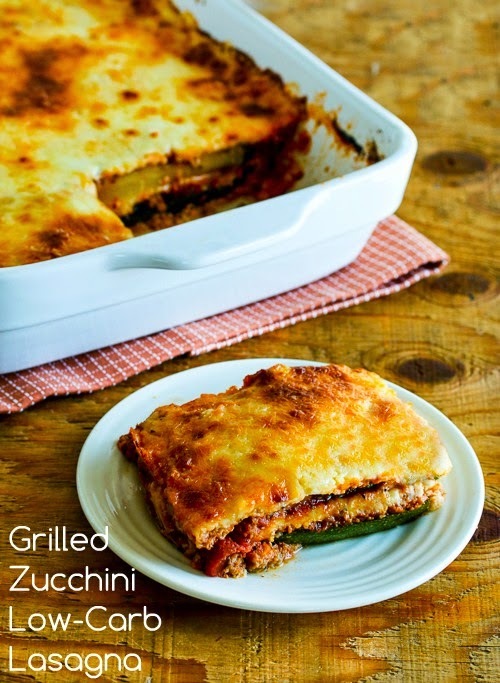 Grilled Zucchini Slices made into Lasagna for a low-carb and gluten-free treat! This recipe is for vegetable gardeners in the northern hemisphere who might be wondering how to use those huge zucchinis that suddenly seem to appear overnight when the garden is winding down. For years I've been making "lasagna" using zucchini in place of the lasagna noodles, and this is one of my favorite uses for those monster zucchinis that are inevitable if you have a garden. Now that I am temporarily without a garden, I buy giant zucchini at the farmers market to make this! Grilling the zucchini removes some of the liquid that might otherwise make the lasagna too watery, and if you don't have an outdoor grill you could certainly do this on a stove-top grill pan. Of course, using zucchini instead of pasta makes a version of lasagna that's low-carb, gluten-free, and South Beach Diet friendly, (and could easily be vegetarian without the sausage in the sauce) but it's delicious as well!